Heating/Conditioning the Shop year round? I am in Central Texas. We are just coming off of 45 days of 100+ temps—though the heat humidity index today is already 102 with a real temp of 89. My shop is 16×24 and I use a through the wall AC/heater unit to heat and cool the shop. The shop is traditional stick built and is insulated. I am an week-end (at best) hobbyist. Right I turn on the Ac or heat before or as I going into the shop. It is not uncommon for the temps in the shop to get into the 90s if it has been some time since I have been in there. I am wondering about leaving the AC on all the time. (I am also looking replacing the wall unit with a Mini Split Mr Slim DIY kit). How many of you hobbyists out there keep your shops conditioned year round even when you at not using it? When I lived in East Tx. I put a timer on my unit to start 1-1/2hr before I got home from work. I find that when people from Texas say “insulated,” they really mean “insulated with an incredibly inadequate amount of insulation.” It’s not your fault – energy has been absurdly cheap in the US up until the last ten years or so. I would not run an air conditioner in a poorly insulated and air sealed shop. It’ll cost a ton to run and you won’t get great results. Instead, insulate properly, air seal, weatherstrip, et cetera, and do go with a mini split system. I’ve not seen the DIY ones, so I can’t tell you if those are any good. The Mitsubishi ones are excellent. Too bad that after FOUR years, you still have not contributed to LJs. Your profile shows all ZEROs except for this ONE topic. Don’t worry about your contributions, or lack of. anybody that doesn’t like it, doesn’t have to respond. Thank you “jbay” for trying to answer for me. It is no small wonder that I have and have had you BLOCKED for quite some time. I heat year round (as needed), but keep it down to 50˚ or so when I’m not in there (detached building). That’s to keep some things from freezing. But for air, we just don’t get that hot so i have a window unit that gets turned on during the hottest days (or the most humid days). No need to thank me Mike, I wasn’t trying to answer for you. I was just trying to explain your crappy response to him. I’ve gotten pretty spoiled with heat and AC over recent years. 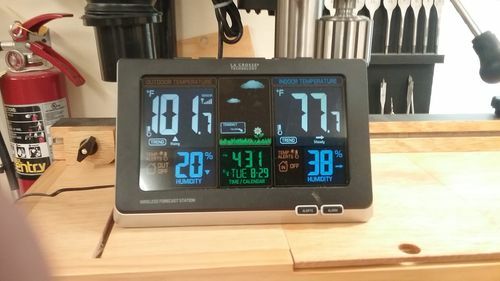 I’m 75 and for most of my life I never had a “decent” woodshop that could be heated and cooled enough to be comfortable. Some were barely shops. I’m in Central Indiana where we can have both hot and cold extremes. We complain but no one listens. About 5 or so years ago I decided to move the woodshop part of my shop into the basement. For many years it was squeezed into my farm shop in a converted old barn near the house. That old 36’’ x 50’ barn has served me well as a farm shop and still does but in the winter you couldn’t get it warm if you sat it on fire. It is prone to be “usable” in hot weather with a few fans but you still tend to drip sweat on tools and projects. Every type of woodshop will have its pro’s and con’s and it is often kind of a balancing act. This basement shop has a lot of pro’s going for it including the fact that it was here and I didn’t have to build it. It was wasted space, stored full of “stuff” that didn’t belong there. A huge pro is that it is nearly automatically heated and cooled by being in the ground and having a heated and cooled house on top of it. This is a slightly tired old farm house that has been remodeled a time or two and has also been added to a couple of times. It is pretty well insulated. There was a small “cellar” under a part of the old house that was built on about 1900 but when the 36’ x 40’ east wing was added about 1970 it was put over a full basement. That 36’ x 40’ is my woodshop. It is 3 rooms, a 24’ x 40’ where anything that makes sawdust resides, the rest is a “strong room” about 12’ x 12’ in the S-W corner and the rest is for shop stuff that doesn’t make dust and some lumber storage. The stairs are also in that last part. The main shop room and that room with the stairs are separated by a 4’ high solid wall with clear vinyl from there up to confine sawdust. Likewise I don’t really have any added cooling cost either. Con’s? A couple. I find that I get sloppy with space and that “stuff” sneaks in at night and fills up most of the flat spots. I am also extremely claustrophobic and the basement is the kind without any windows. It also didn’t have a very convenient access without coming through the house. Thanks to a son with pretty much unlimited access to excavating equipment I have a wide walk-out door (with a window). I can back my truck right up to the door for loading /unloading. Having a window lets me look out and makes the whole shop seem a lot more open. If there is an extra heating / cooling cost for the shop it is buying high quality furnace filters and changing them more often. That isn’t much $$$. A huge pro is being able to walk downstairs any time I feel like it (like if I can’t sleep at night) and putter in the shop for any amount of time I want to. I don’t have to plan heating and cooling ahead or wrap up like an Eskimo. I’m a little late to this party. But to the OP, I can’t recommend mini-splits strongly enough. Most are extremely efficient. While Mike is happy with his setup, relative to what he had, his experience is still unusual because of the small amount of insulation he has. Your shop is 384 sq-ft. Assuming it has nominal insulation of R-30 ceiling, R13 walls, you probably can’t buy a mini-split that is too small. There is an AC rule of thumb, of 400-600 sq-ft per ton of AC. This will almost always be too much. This is the number that guarantees a customer won’t call back saying it doesn’t get it cold enough. It’s not uncommon that this can result in 2-4X too much AC. Too much means more up front cost, much lower efficiency, and it won’t reduce humidity as well. However, every situation is different and that is why rule-of-thumb calculations are a poor replacement for actual design. Many factors affect how much AC you need. Your local climate of course, all construction details, type of roof, windows, floor type, common walls with other structures, north-south orientation. Heck the color of the roofing makes a difference. No one of these makes a huge difference (other than climate), but 2-dozen little things add up. But, your shop is small enough that even the smallest AC mini-split I have seen (7,000 BTU/hr = 0.59 tons) would still be 658 sq-ft/ton and therefore only just slightly above the rule-of-thumb that is itself probably 2-3X more than you need. Point is, if you have normal insulation don’t go throwing a 2-ton AC mini-split in your shop. It will cost a lot more up front, and be much less efficient. Mike did it because his shop is not well insulated, yet. Ideally, a properly sized AC unit will run nearly all the time during the hottest days of the year. As to running it 24/7 or not. If you are not in the shop during the work week, then it would make sense to set the thermostat back. I’m sure turning it off completely would be the least amount of electricity. This is true if you won’t be using it for days at a time. Even with regular heating and cooling, there is little advantage to setting thermostats back on a daily cycle. The common thing is to let the house warm up all day while you are at work. The thing is, then the AC runs all evening to pull all that heat out of the house. It saves little energy and you have an uncomfortable house when you come home. With mini-splits it’s not even a question for daily use, just leave them running 24/7. I’ve barely been in my shop this summer, and I still just leave it temperature controlled. Though set to 82 or so. my shop is about 300 sq-ft and being part of a converted garage, it shares 2 walls with the house and has a relay well insulated and sealed doors. So it doesn’t take much to keep it cooled. All that said, I’d go with a mini-split, and then keep the shop controlled at a higher temperature during the week, like 82 deg (or whatever). Then have it set to 74 deg (or whatever you want) Saturday morning through Sunday evening. I think there is also an advantage to not exposing your shop to extreme temperatures. Glues and finishing products will store better. And really, just about everything will hold up better over the years if it isn’t being cooked every summer day and frozen every winter night. If your shop is well sealed and insulated, I wouldn’t be surprised if you had a hard time seeing the increase in your electric bill. 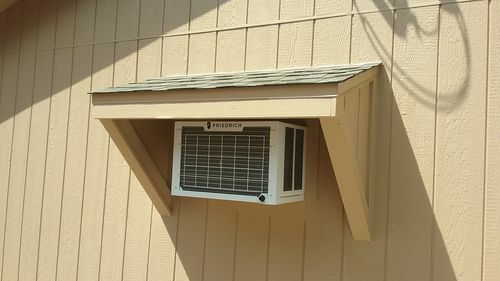 Especially given if you probably have a house you are already running AC in and like most of us, that AC is probably old-school, inefficient, and over-sized. Good luck, and if you do the DIY mini-split, please report back. I have a slightly larger detached shop than yours, 440 square ft. I also have a through wall a/c-heater 10k BTW. It helps to have your unit out of direct sunlight. It helps to open your windows and doors early am if you know you’re going to be working in the shop that day. If your unit has a “energy saver” mode, turn it off. It costs more but gets the shop cooler. Make sure your vent on the a/c is closed unless you’re airing out the shop. Today, I came home early. 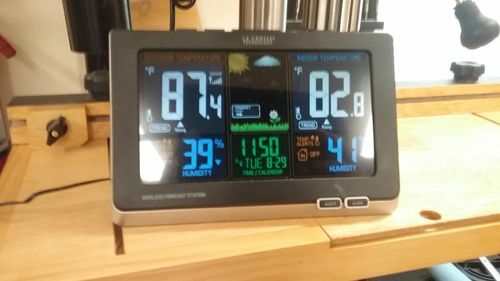 Temps were 87 outdoors 82 in the shop at 11:50am. When I finished this afternoon, temps were almost 102 and 77 inside. Even yesterday when temps hit 109 I was able to keep the shop at 78 degress. I’m curious as to the size of your unit and the thickness of your insulation?